Heat olive oil in a 6 quart enameled dutch oven over medium-high heat. Once oil is hot add chicken and diced onion, green, and red peppers, and saute until chicken is no longer pink, about 6 minutes. Add garlic and saute 30 seconds longer. Add chicken broth, green chilies, cumin, paprika, oregano, coriander, cayenne pepper and season with salt and pepper to taste. Bring mixture just to a boil then reduce heat and simmer 15 minutes. Stir in 1 can of Cannellini beans, then process 3/4 of the remaining beans along with 1/4 cup broth from the soup in a food processor until pureed, add bean mixture to soup along with remaining 1/4 can of beans. 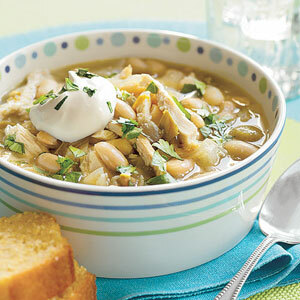 (You can skip the pureeing step and just add the beans directly to soup, the soup just won’t be quite as creamy). Add black beans and simmer about 15 minutes longer. Mix in fresh lime juice. Serve with Monterrey Jack cheese, chopped cilantro and tortilla chips for dipping if desired.